What's that Cheeky Sound Around the Barn? And since their little flock doesn't have a rooster, it seems Cheeky has stepped up to be head chicken-in-charge! 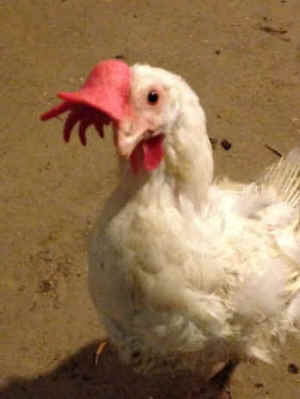 The staff was surprised recently to hear a loud crowing from the barn where no roosters live. We searched the stalls, but there wasn't a rooster in sight. Suddenly the crowing sounded again! After a little more searching the mystery was solved. It wasn’t a rooster we heard. It was a hen named Cheeky! Cheeky was part of a large hen rescue last year and received her name because an impaction in her cheek required constant care. She was moved into the barn and quickly made herself at home in the kitchen. Her favorite game was to sneak through the cat door when the staff wasn't around, hop onto the table, and mischievously knock eggs to the ground for a snack! She made a full recovery long ago, but Cheeky prefers to still hang around the barn with some other free-roaming chickens. And since their little flock doesn't have a rooster, it seems Cheeky has stepped up to be head chicken-in-charge! She looks after the other girls and likes to shoo away visitors. So the next time you visit Catskill and hear a loud crow, look out for little Cheeky!